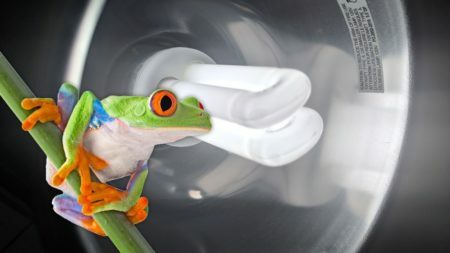 Knowing the temperature and humidity is one of the most important parts in keeping reptiles or amphibians. 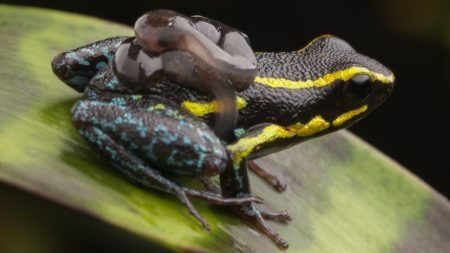 Frogs especially need careful monitoring when it comes to humidity. For that reason, it’s crucial to have an accurate device that reads that information. That’s exactly what this page is about; temperature and humidity reading devices. 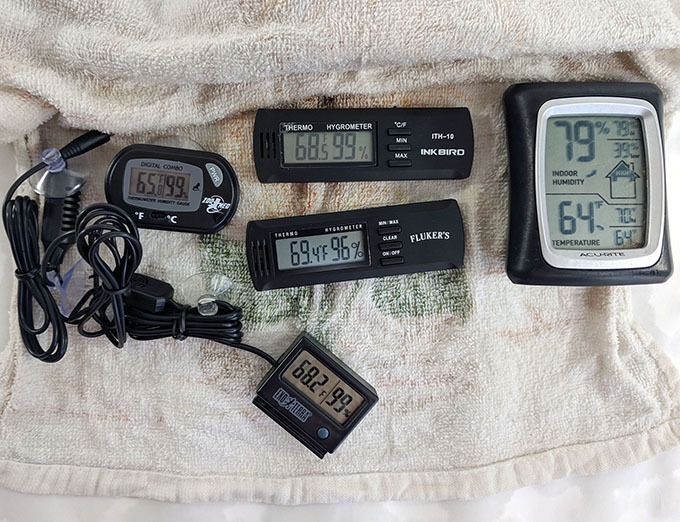 I bought five of the best thermometer/hygrometer combo meters and tested them in an head-on-head battle against each other to determine which is best. I’ll first explain how I chose these devices and what I did to test them. After that, I give each of them an individual review. 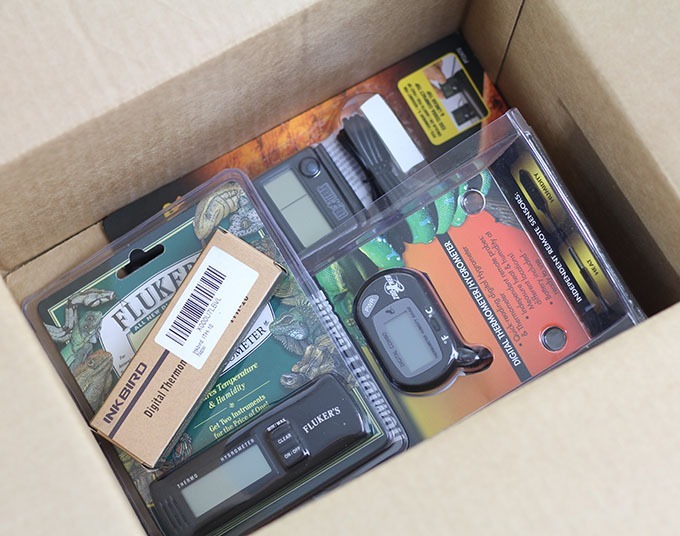 In the last sections, I wrap things up by giving you some basic info about thermometers, hygrometers, heat, and humidity. 3.2 How Accurate Are They? I selected four of the highest-rated products on Amazon. I already had an AcuRite Pro which is one of my all-time favorites. That’s how I came to select these 5 combo meters. I tested them by placing them side-by-side for several days. First by sitting them on a desk in my office and then by placing them in a terrarium. 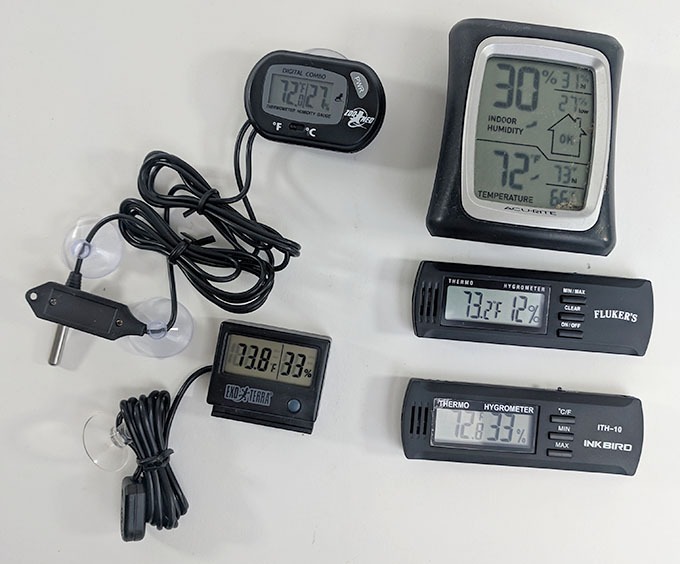 Unboxing the four digital thermo-hygrometers. To get things started I had to unwrap each one, turn them on, and let them sit for several hours. The reason for this is to allow each one plenty of time to adjust to the room temperature and humidity. 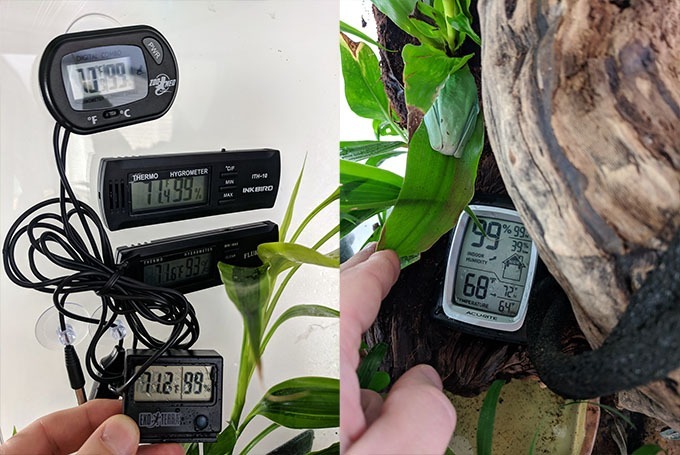 Also, one of the devices I tested was already in my Red-eyed tree frog’s terrarium so it needed a chance to adjust to the room temperature as well. Unboxed and opened – I let them set for several days. The next test was one to check the hygrometer, the part that measures the humidity. I wanted to see how high they would go. Now, eventually I put all of them in my tree frog’s terrarium but for now, the way I performed this test was by wrapping all the hygrometers with a damp towel. After several minutes covered by a damp towel. This wasn’t the most sophisticated test but for a few $10 – $20 temperature & humidity readers, I felt it would suffice. They were all similar in reading except the AcuRite. That’s because this one takes quite a while to adjust. Had I left the towel covering it for a few more minutes it would have shown something similar to the others. Finally, I attached all of them to the side of a terrarium. I monitored each device over several days, before and after misting the enclosure. The results of the test were surprising! And I even found a new favorite. 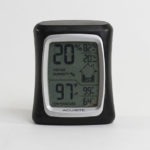 This section goes more in-depth about each thermometer / hygrometer. I’ll cover my likes and dislikes as well as make some comparisons between them all. In case you’re wondering, I listed these reviews in order of which ones I recommend the most. Zoo Med is my top choice while Fluker’s is my bottom choice. The other three are tied for second. The reason is that the Exo Terra, AcuRite, and InkBird are better depending on the situation and setups. My top pick for the best all-around combo device is the Zoo Med Thermometer Humidity Gauge. The main reason is that its the most versatile. Not only is temperature and humidity reading accurate, but it has separate probes for the temperature and humidity reader. Another reason I like this device is that it has a suction cup on the back. Simple, right? Having a suction cup means you can stick it to any tank; whether its an aquarium, exo terra terrarium, zoo med terrarium, zilla tank, etc. This and the Exo Terra combo meter are both great. I had to choose a winner and it literally came down to the mounting options. 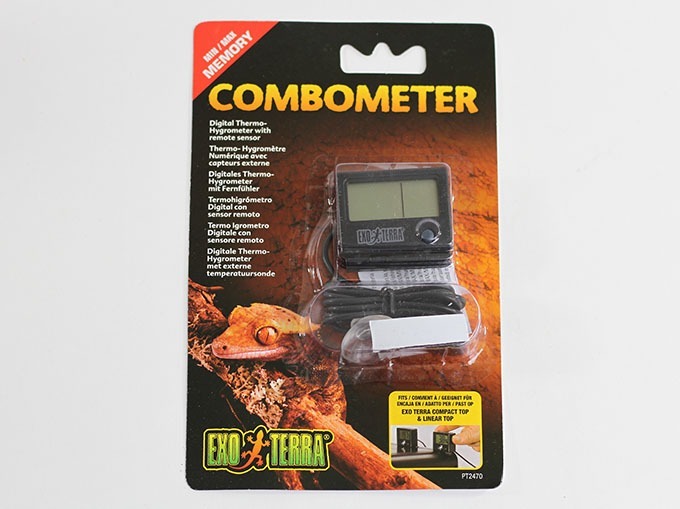 Zoo Med’s temp/humidity reader can be mounted in any tank whereas the Exo Terra combo meter can only be mounted on Exo Terra terrariums. One problem I ran into with this meter had to do with the hygrometer probe. If water droplets formed on the probe, it reads 99% humidity. To remedy this, place the hygrometer probe in a location that you’re not likely to mist directly. The Exo Terra combo meter came in at a close second. In fact, I’m partial to this one but I won’t recommend it unless you have an Exo Terra terrarium. The reason is that it’s designed to slot into the back of the terrarium. You can’t mount this on other terrariums or aquariums. I repeat; only get this one if it’s going on an Exo Terra terrarium! It’s a great product, though. 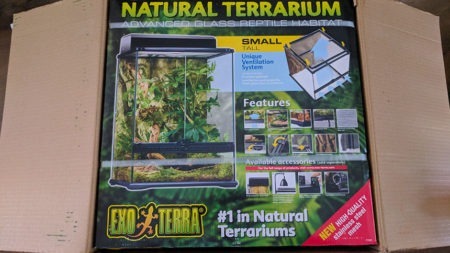 Seeing as Exo Terra makes some of the most popular terrariums, there’s a good chance that you, like me, are using one of their enclosures. If so, this is the one I recommend. The Combo Meter slots in the back of an Exo Terra terrarium. It has a nice, simple design. My only complaint is that it only mounts to an Exo Terra terrarium. If you’re looking for a high-quality, low-profile option, this is the one for you. It’s sleek, small, easy to use, and mounts via velcro pads that you stick to the inside of your reptile or amphibian’s enclosure. Take a close look at the pictures on this page and you’ll notice that the Inkbird and Fluker’s combo meters are virtually identical. The only real difference is the logo. 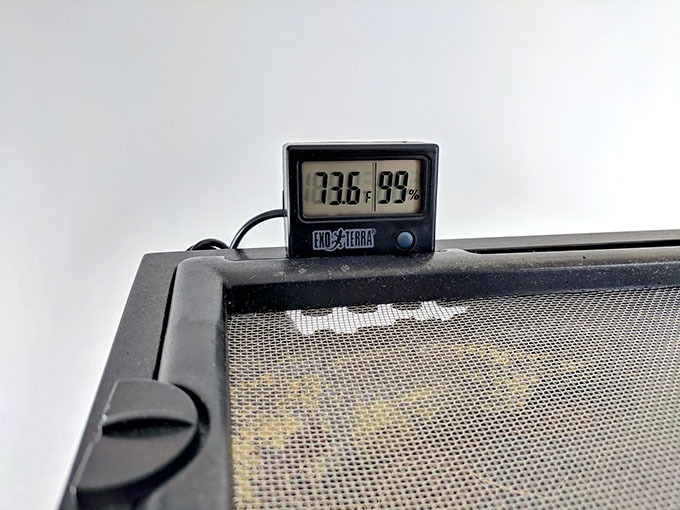 With this in mind, I assumed the heat and humidity reading would follow-suit; having the same reading so long as they were positioned around the same spot within the terrarium. That wasn’t the case. Almost immediately I began noticing a large difference in the humidity reading. 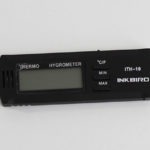 I compared all the thermo/hygro meters over the course of several days. Almost every time I checked the devices, the Inkbird and Fluker’s meters were 10% – 20% different. So what happened? Well, I’ll explain more in the Fluker’s review but I’ll wrap this up by saying that the Inkbird outperformed Fluker’s. It was on-par with all the other thermometer/hygrometers, coming within a few degrees difference in temperature and humidity. The AcuRite has been an all-time favorite of mine for a while. Up until I did this comparison test, it was my favorite. I still recommend this product due to its accuracy and 24-hour high/low logging but because of its size and design, it’s no longer my favorite. Reading the AcuRite is about as good as it gets. Among the other devices on this list, this one is the easiest to read. It remained accurate in comparison to the other devices throughout the entire test. In addition to its easy-to-read display and high accuracy, it has another unique feature. That unique feature is the ability to record and display the highs and lows over the last 24 hours. It does this for both temperature and humidity. This is a great feature to have if you’re ever wondering exactly how low the temperature gets in your pet’s enclosure at night. Despite everything it has going for it, the AcuRite has a major drawback. It’s difficult to mount. It isn’t designed for a reptile or amphibian enclosures. It has a magnet on its back but that’s not enough. I ordered magnets in hopes of attaching the AcuRite to the side of the enclosure. It didn’t work. Either the glass is too thick or the magnets aren’t strong enough. Probably a combination of the two. Regardless, it didn’t work. In the end, I decided the AcuRite works best my sitting it on the substrate, a rock, or other flat surfaces within the enclosure. For this reason, I only recommend this product if you have a terrestrial frog setup or as a backup. It can also be used in conjunction with another thermometer/hygrometer. Place this one on the ground and the other one towards the top of the enclosure. This will allow you to see how much of a temperature gradient you have in the enclosure. Doing this helps to ensure the temperature and humidity are optimal in verticle-style terrariums for arboreal species. This is the last combo meter I tested. It’s also the one I least recommend. 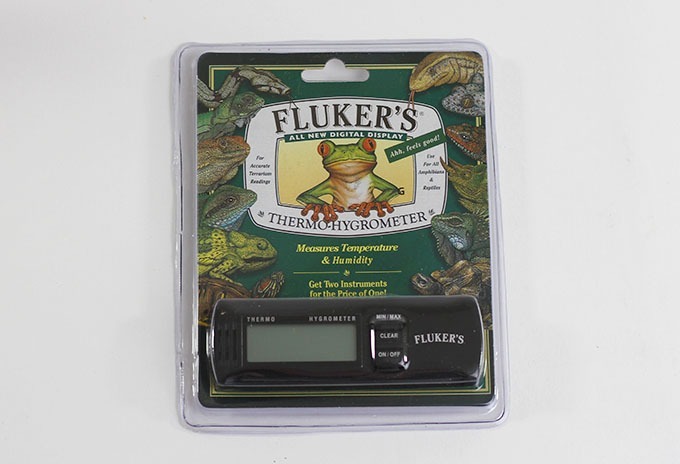 Granted, the Fluker’s thermo-hygrometer is better than most of the cheap products on the market, it was the least reliable one in my comparison. If you read the Inkbird review then you’re aware of the similarities between these two. They have the same shape and design yet the accuracy was quite different at times. 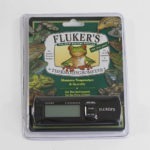 The Fluker’s hygrometer reading was constantly 10% – 20% different than all the other ones before placing them in the terrarium. Maybe I got a faulty hygrometer? Who knows? Anyway, what I do know is that the readings were all over the place at first. I noticed this right away, too. I left the meters setting on a desk for several days to be sure I was giving them enough time to adjust. Throughout those days, the Fluker’s product was usually 10% – 15% off while the other 4 devices were within 5% of eachother. The thermometer (the temperature reader) wasn’t too far off, but more so than the others. When I got this product installed in the terrarium, it seemed to do better. It began matching up with the others within 5% – 10% most of the time. I like the design. It’s small, readable, and easy to mount. Seeing as how the Inkbird product has the same design but its more accurate, I recommend going with that one. “What is a Thermometer/Hygrometer?” This question is best answered by breaking up the words “thermometer” and “hygrometer”. A thermometer measures temperature. Thermo refers to heat and meter is a means of measurement. A hygrometer measures the humidity. Hygro refers to moisture and, as mentioned above, a meter is a way of measuring. A thermometer/hygrometer is a digital or analog device used to read and display the temperature and humidity. Humidity affects animal life, properties of air, and the materials that are in contact with air. It greatly affects climate and it’s an important atmospheric greenhouse gas. Likewise, the temperature is important and certainly plays a role in humidity. Relative humidity refers to the amount of water relative to what the air can hold. Warm air holds more water than cold air. This becomes obvious by watching a digital thermometer/hygrometer in a contained environment like a reptile or amphibian terrarium. The relative humidity quickly drops in percentage as the temperature rises. I became aware of this while watching the levels change shortly after my terrarium’s heater kicked on one morning. As the temperature went up, the humidity level went down. 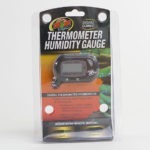 With regards to measuring humidity levels in terrariums, it is not uncommon to get errors from a hydrometer. The results can deviate from the accurate readings by as little as 2% to as much as 20% RH (relative humidity). For temperature, it ranges between 0.5 °F to 2 °F, depending on the thermometer. In most cases, thermometers are fairly accurate so the temperature accuracy won’t be an issue. It’s the humidity reading device, the hygrometer, that tends to cause the most trouble. Improper calibration and poor installation can result in varying degrees of error too. 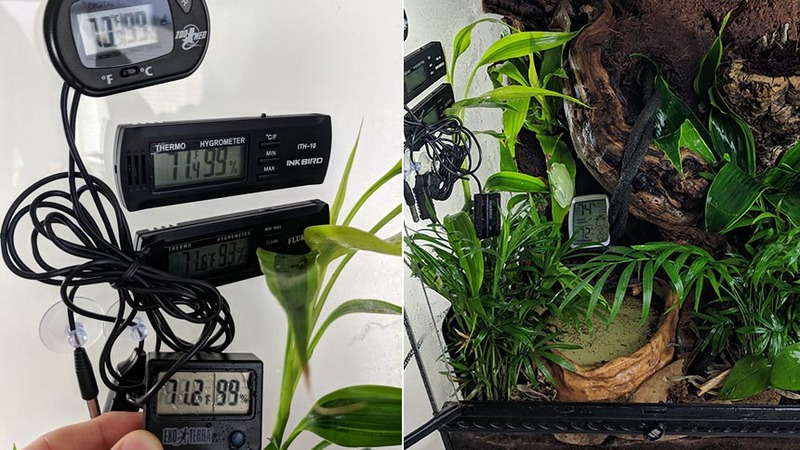 Simply placing a temperature and humidity monitor in the wrong spot of your terrarium can negatively affect the reading. Aside from that, some of these products are just worthless. They’re cheap and poorly crafted, only sold to make a quick buck off the unsuspecting herpetologists. 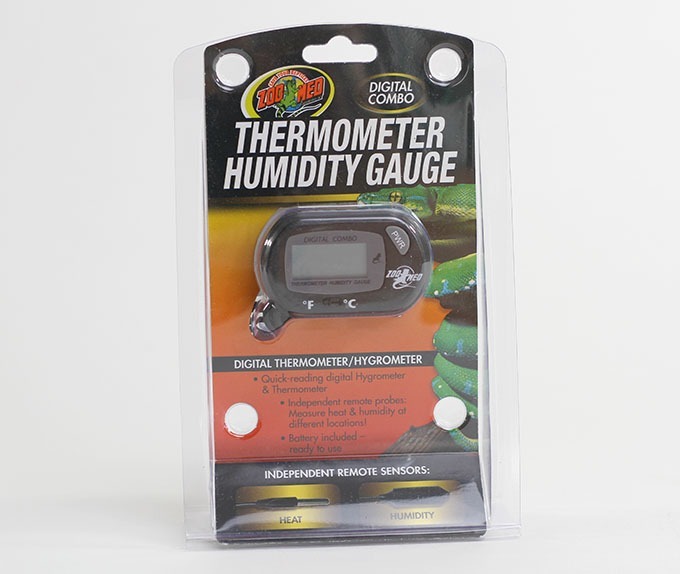 A hygrometer that’s wrong by 20% can cause a lot of problems for a frog that needs to stay within a small humidity range. Finding the right thermometer / hygrometer can save you time, money, and frustration. It also has the potential to save the life of your pet. 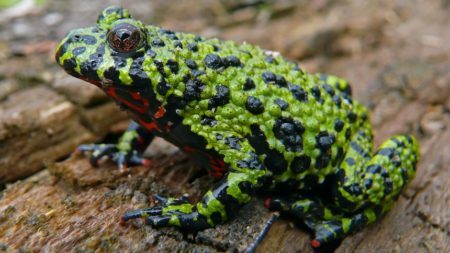 An unreliable hygrometer that’s wrong by 20% can be harmful to delicate amphibians. 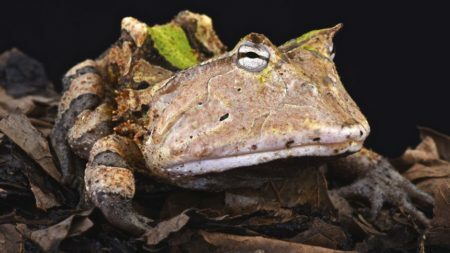 Imagine you’re doing the best you can to mist your frog’s enclosure as often as needed, only to no avail because your hygrometer was wrong? The health of your pet can decline and you’re left wondering what you’re doing wrong. Likewise with the temperature. Providing a proper habitat for exotic animals is the base requirement for keeping them. That’s why I invested some time (and money) into testing 5 of the top rated thermometer/hygrometer combo devices. My goal is to provide my pets with the best care while recommending the best products to you, too. So, here it is. My final recommendations. 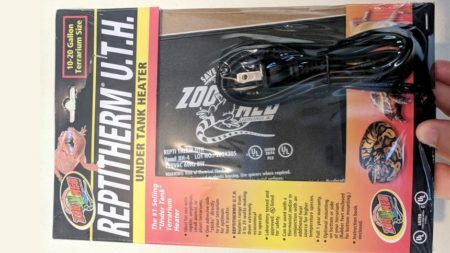 All-in-all, I felt the Zoo Med Digital Thermometer Humidity Gauge (link goes to Amazon) offers the most bang for your buck. It’s reliable, has separate probes for the temperature and humidity sensors and it comes with a suction cup for mounting. The Exo Terra was definitely on-par with Zoo Med but you can only mount them on the back of Exo Terra terrariums. 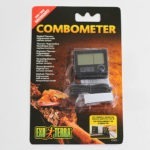 Only buy one if that’s not a problem (ie – if the combo meter is going on an Exo Terra terrarium). 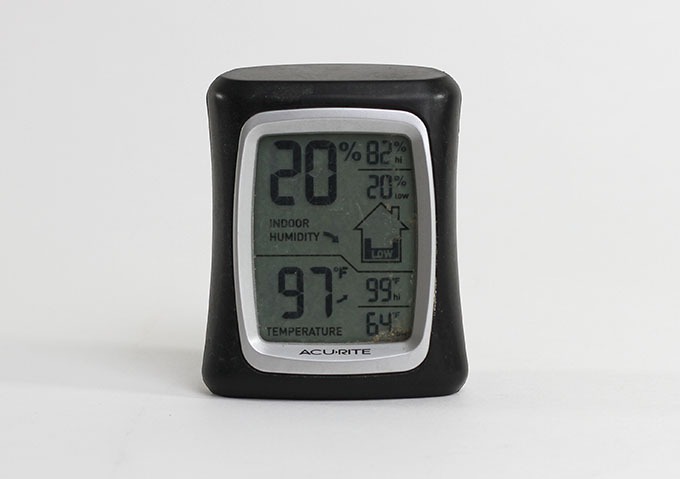 AcuRite is accurate and provides the high/low temp and humidity over the last 24 hours. This one would have been my favorite if only there were an easy way to mount it the side of the enclosure. For now, its best left sitting on the substrate. Finally, we have the Inkbird and Fluker’s products. They look exactly the same aside from the logo sticker on the front. For all I know they are made at the same place (they probably are). 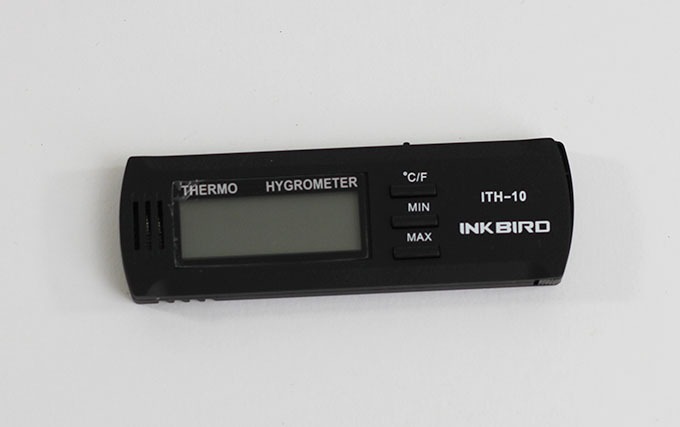 However, the Inkbird hygrometer gave better readings than Fluker’s. If you pick one of these, I recommend Inkbird. It’s a quality, low-profile option for reptile and amphibian enclosures.